When I began working at the USITC, I had heard stories of how much work the Budget would be each January, and that every year, without fail, the person in my position had to work around the clock the weekend of the Superbowl to ensure the Budget Justification would arrive to Congress by the deadline (the first Monday in February). As Henry Ford used to say, “Work smart, not hard.” While I’m a hard worker, I realized if I approached the task differently, I might not have to work around the clock leading up to the deadline. When I took a look at the previous budgets, and learned about the process in place, I realized that the Budget could be created much more efficiently using smarter processes and more current and capable software. I recreated all charts, tables, and graphs in Adobe Illustrator (with data pulled from Microsoft Excel files as they were updated by others). 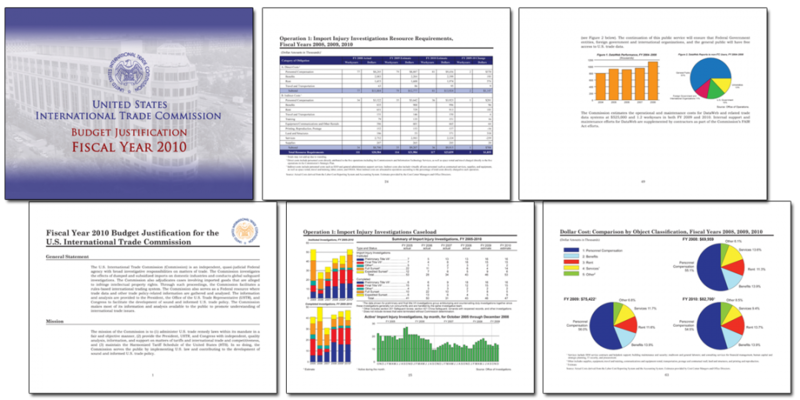 I created a new layout in Adobe InDesign (upgrading from the very outdated Interleaf Quicksilver), and broke the Budget up into a number of files (primarily by chapter), so that I could then create two books (the 2010 Budget Justification and the 2010 Budget Justification Executive Summary), which both include varying degrees of the same information. Doing it in this way allowed for dynamic page numbering, table of contents, and cross-references in both files. When all was said and done, the Budget and Summary were both completed the Friday evening before the Monday deadline, the earliest it had ever been completed. The Executive Summary is below.